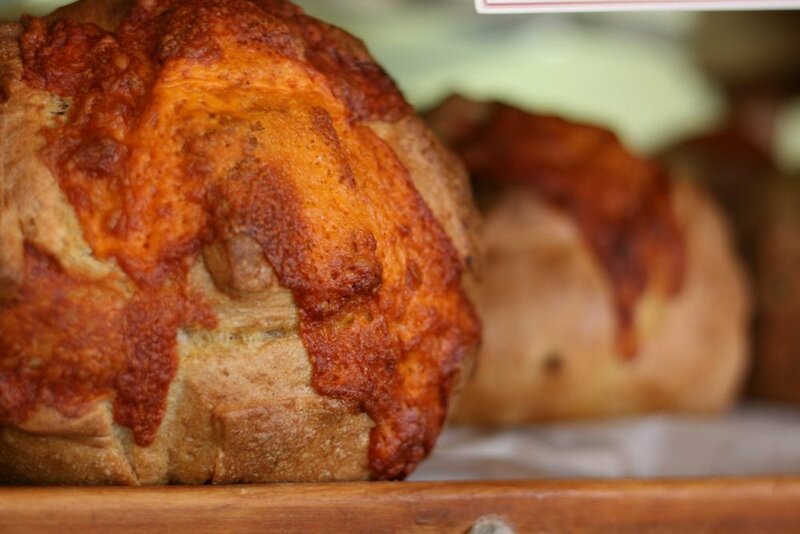 Baked daily in our own ovens, our wholesome artisanal breads are made using fine, fresh ingredients. *Our specialty loaves and sourdough varieties rotate weekly and seasonally, please ask our staff or call us about today’s featured bread. Baguette (vegan friendly)- Our version of the french classic has 4 ingredients – unbleached bread flour, semolina, sea salt, and yeast. Chewy on the outside and soft inside, perfect for making garlic bread. Buttermilk Cornmeal– Buttermilk and cornmeal give this white loaf a richness and wonderful texture. Perfect for dunking into our homemade chili. Cheese & Garlic Sourdough Bread– One of our most popular breads often consumed in one day by customers. Large chunks of old cheddar and garlic cloves are added to a soft white dough making this bread a wonderful treat. Cinnamon Buns– Available only on the weekend, often disappearing within the morning. A soft butter dough is rolled with sugar, plenty of cinnamon, raisins, and pecans. A generous drizzle of icing is added once out of the oven. English Muffins– Our delicious, baked fresh English Muffins are perfect for egg sandwiches, mini pizzas or just warmed with jam. Seedy, wholesome and easy to love. Flax Bread (Dairy and Egg Free)- One of our most popular breads being a great choice for breakfast toast and sandwiches. Made primarily with whole wheat flour, whole and ground flax seeds, and a touch of honey to round out this wonderful loaf. Fruit & Nut Bread (Dairy and Egg Free)- A fantastic bread that we adapted from our old cinnamon raisin bread. We made it even tastier by adding fresh chopped apples, dried cranberries and pecans. A mixture of whole wheat flour and unbleached bread flour complete the loaf. 4-Grain Bread (vegan friendly) –A dense and hearty loaf, 4-grain is packed with soya grits, whole millet, flax seeds, and whole wheat flour. A touch of molasses gives subtle sweetness. Oatmeal Bread– Our most popular bread sold at the Bakery. Made with unbleached bread flour and whole oats. A touch of honey adds the right amount of sweetness. Very popular among kids! Multigrain Baguette (vegan friendly)- You can be sure to find our multigrain packed full of wonderful good for you seeds and grains. We added whole wheat flour to the dough along with cornmeal, rye flour, whole oats, flax seeds, soya grits, whole millet and perhaps a few other good things. Sesame Bagels– Our version of the bagel is pure and simple. Unbleached bread flour, whole eggs, and honey make the dough. The bagels are boiled before being baked to give them our trademark shiny, chewy texture that we all love. Each bagel is generously covered in sesame seeds. Spelt Sourdough– Made with organic spelt flour, this sourdough is perfect for those sensitive to gluten. Spelt flour is an ancient grain that has less gluten than regular bread flour. Sunflower Bread (Dairy and egg free)- Whole wheat flour, unbleached bread flour, water, whole sunflower seeds, honey, sea salt, and yeast add up to another great breakfast or sandwich loaf. WtG Wholewheat Sourdough– This hearty whole wheat loaf with a sourdough twist is perfect for the wholesome bread lover.